Governor Schwarzenegger is hosting a series of renewable energy activities in the California desert over three days, March 22nd to March 24th. CEERT is a sponsor of these efforts to help break the logjam in permitting a variety of renewable energy projects that can help the state meets its renewable energy and greenhouse gas emission reduction goals. V. John White, CEERT executive director, and Rainer Arlinghoff of Solar Millennium LLC at the desert renewables symposium. 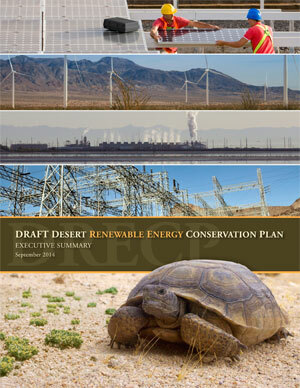 The federal-state renewable energy policy group (REPG) will tour a variety of sites in the desert. At 11:15 AM the Governor and Secretary of Interior Ken Salazar will join the REPG at Harper Lake/Kramer Junction to announce the renewed commitment and new efforts to get renewable energy projects sited to receive ARRA funds and to develop a plan for renewable energy development in the desert. I invite you to join me at this event. There will be two policy meetings at the Mission Inn in Riverside. The kick-off of the Desert Renewable Energy Conservation Plan Stakeholder Advisory Committee will be from 9:00 AM to 12:45 PM and is open to the public. The charge to this group is to develop a planning process for the desert that will identify places for renewable energy development and protection for endangered species and plants. The state-federal Renewable Energy Policy Group will meet from 1:30 until 5pm. It is not open to the public. Planning for the Future: How do we ensure projects are built quickly and in the right places? Each panel will report back on their discussions and recommendations. Assemblyman Manual Perez is the luncheon speaker. Michael Picker of the Governor’s office, Steve Black of the Department of Interior and Bob Copper, the Director of the DRECP, will speak about their individual and collective efforts to achieve balance with environmentally sustainable renewable energy projects in the desert. To facilitate participation, CEERT will have a bus at the Ontario airport to leave at 9:00 AM. Please let Merrisa Moore (Merrisa@ceert.org) know if you would like to participate. At the conclusion of the press event the bus will return people to the Ontario airport and take those who are attending the Conference to the Mission Inn in Riverside. This entry was posted in Clean Energy. Bookmark the permalink.